In the bottom slide (with Colby College) STH President is 1 and Prof Roy 2. 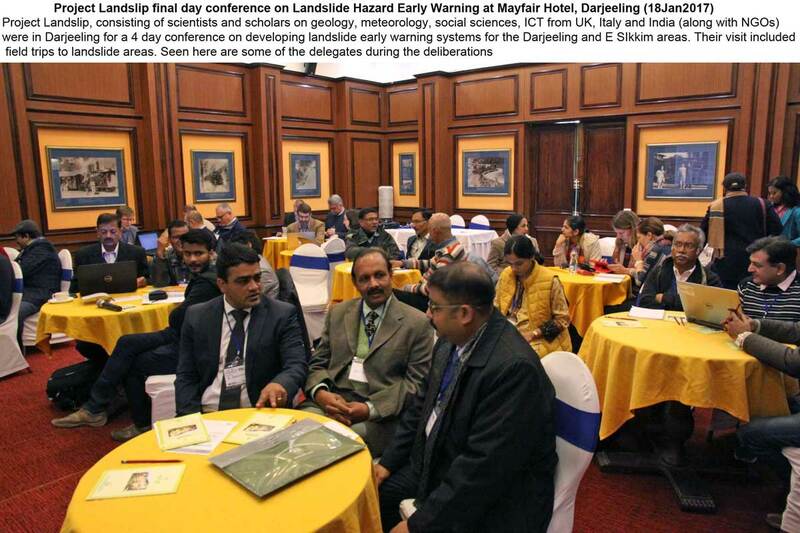 "Darjeeling, Jan. 19: An international science consortium has picked Darjeeling in north Bengal and the Nilgiris in south India to test a new mechanism for landslide risk reduction through better assessment, early warning systems, and improved community preparedness. Scientists from India, Italy, and the UK plan to combine terrain geology with weather data to improve their understanding of landslide dynamics and use that information for risk assessment and alert local communities to potential hazard zones. Tracts of the Darjeeling hills are highly vulnerable to landslides that have killed many people over the years. In July 2015, more than 40 people died or went missing in landslides across the hills. Some areas of eastern Sikkim will also be included in the project. 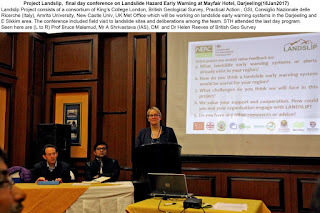 The scientists caution that their four-year project, funded by the UK's Natural Environment Research Council, the Department for International Development, through the Science for Humanitarian Emergencies and Resilience programme, does not seek to predict landslides. "First and foremost, we are not predicting landslides. What we are doing is looking at and collecting information on landslide hazards," said Helen Reeves, the director of science for engineering geology with the British Geological Survey. The Geological Survey of India, a major partner in the project, will provide the landslide data available for the area since 1899. "One of the reasons for choosing this area is that data availability, landslide susceptibility, and varied terrain conditions," said Saibal Ghosh, the director of GSI. "Tea gardens here, too, have maintained rainfall data for decades and it will also be useful." Bruce Malamud, professor of natural and environmental hazards at King's College, London, said: "The project will look at a combination of things such as elevation, geology, and landslide susceptibility. We are basically saying there could be an elevated chance here, and a reduced chance there." The scientists plan to generate early warning systems to disseminate potential hazard information among local communities. The Italian National Research Council has already developed a forecasting system that regularly alerts local governments. The India project will also seek to involve district administrations to reach out to communities, although the medium of communication is yet to be determined. "We will look for what best suits the local communities," said Malamud. "Maybe, we could work out a system that could use text messages, social (media), smartphones, radio, or other wireless systems." Scientists from India's Amrita Vishwa Vidyapeetham University, the UK Met Office, Newcastle University, Consiglio Nazionale delle Ricerche, Italy, among other institutions are also collaborating on the project. Praful Rao of Save the Hills, an NGO based in Kalimpong which is working on natural disasters, said: "The very fact that an international consortium is working on landslides in the region is a major development. This would lead to a better understanding and preparedness for risk reduction." The project also plans to invite experts from Afghanistan to share experiences with regard to landslides."